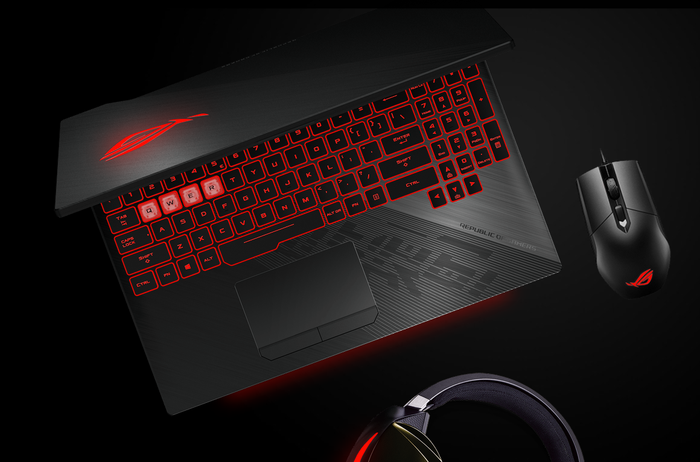 With the original ROG Strix range, ASUS took the gaming laptop one step further. 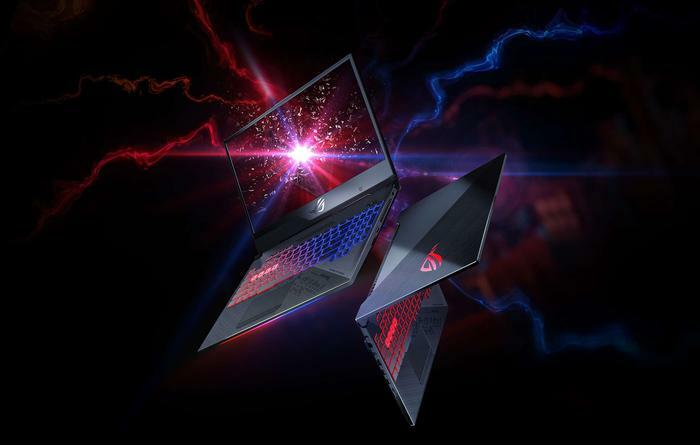 Look beyond the deluge of neon-lit gaming laptops that roll into retail year, each with ambitions of capturing their slice of a monolith ‘gamer market’, and you’ll see the Strix Hero and Strix Scar. With both, ASUS took a more specific approach. Each emphasized a discrete genre of game. This year’s successors to the ROG Strix name don’t really break from this. But that’s not really a major problem. The underlying argument is almost just as resonant a second time around. Why go for any gaming laptop when you could opt for one just that little bit tailored to enhance the types of games you play? If it’s something like Call of Duty, Counter-Strike or Overwatch - the SCAR has you covered. If you’re keen on MOBAs like League of Legends, DOTA 2 or Heroes of the Storm, the Hero is the option you want. Pick your poison. Again, as with last year’s crop, the new Hero II and Scar II are each is geared towards a different audience. A few slight adjustments to the keyboard promising to make one a better fit for FPS gamers and the other a better option for MOBA fans. However, beyond the keyboard, there aren’t a huge amount of differences between the two notebooks in question. Then, in terms of form-factor and aesthetics, both the Scar II and Hero II strike a very similar chords to their predecessors. They look sharp, but aren’t as overtly obnoxious as some other gaming laptops. That said, they do come a little leaner and meaner in a few key areas. To start with: bezels. In line with current trends, both the Scar II and Hero II tout 15.6-inch displays with super narrow bezels that are 2.33cm thinner than that found in last year’s Scar and Hero. Still, they’re not quite on the same level as the Zephyrus M for portability. Both the new Scar and Hero also feature displays with a 144hz refresh rate and 3ms response time. There’s also a little more RGB in the mix, courtesy of a new AuraSync-enabled lighting bar. Other improvements are less visible and more likely to be heard than seen. Both notebooks feature upgraded 12-volt fans, which offer 20% better fan speed and 42% increased air flow. The heat-sink has also been upgrade to feature more - and thinner - fans while the insides of the device have been buffed with a bit of extra thermal cladding. Last but not least, there’s a new feature called Overstroke. This feature, integrated into the keyboard, is said to reduce the actuation point of the key-switches here compared to that found in last year’s models. According to ASUS, "ROG-exclusive Overstroke technology enables earlier key actuation, and has a longer overstroke distance for fast, accurate and effortless keystrokes." In practice, this Overstroke-powered experience proved surprisingly tactile and responsive. I wouldn’t say it was on the same level as a full-blown mechanical. Still, it was definitely a step above the usual fare you’d find in a gaming laptop of this caliber. I noticed it somewhat, but it wasn’t a game-changer. That said, the inclusion of zone-based lighting in the Hero II’s keyboard is a bit of a disappointment. It doesn’t allow for the same degree of customization as you would with per-key RGB and the illuminated key switches themselves look a little dim and tacky. If anything, the new AuraSync-enabled light bar at the bottom - which looks great - draws attention to how lacklustre the RGB on the keyboard is. Fortunately, when it came to playing games on the Strix Hero II, we didn’t come away disappointed. The medieval Kingdom Come: Deliverance (set to the highest settings) was managed at a respectful 40-52 frames-per-second. This dropped closer to 30 frames-per-second during intensive sequences like sword fights and horseback chases. Then, the Strix Hero II fought its way to 63 frames-per-second on Total War: Warhammer II’s battle benchmark, 74.6 frames-per-second on the campaign benchmark and 68 frames-per-second on the skaven benchmark. Finally, and most-impressively, the PC version of Capcom’s Monster Hunter World tended between 40 and 45 frames-per-second when set to the highest settings possible. 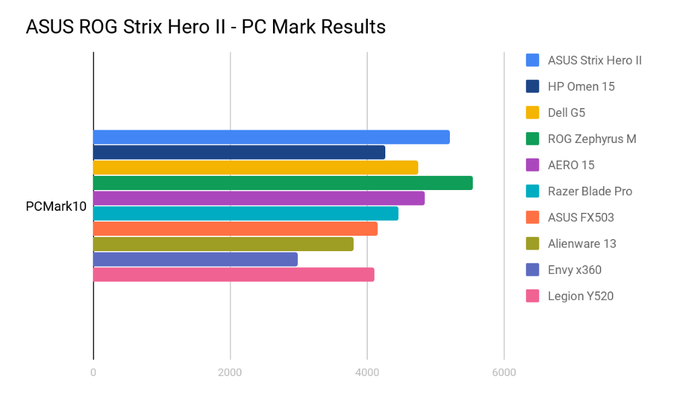 On the benchmarking front, the Strix Hero II managed to outperform pretty much every other gaming laptop we compared it to, sans ASUS’ own Zephyrus M, on PCMark’s Work 2.0 test. Unfortunately, this dominant trend failed to translate into the suite of 3DMark tests we subjected the Strix Hero II to. Here, the Strix Hero II did perform quite well but it lagged behind some of the competition. It feel short of both HP’s OMEN 15 and Gigabyte’s AERO 15. 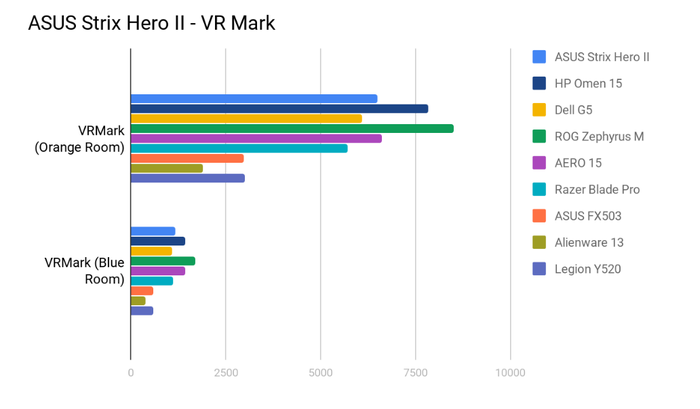 That hierarchy was largely-replicated when it came to gauging the VR-readiness of the ASUS Strix Hero II. 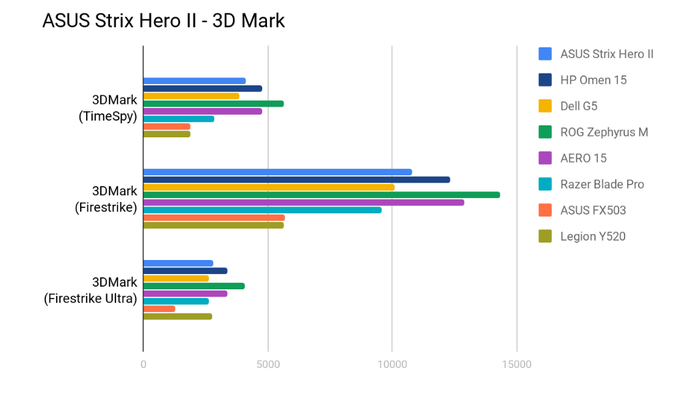 Here, the Strix Hero II managed to beat out the Dell G5 and Razer Blade Pro but - again - failed to surpass the HP OMEN 15, Gigabyte AERO 15 and ASUS ROG Zephyrus M.
As for battery life, the Strix II actually managed to swing well above the norm for gaming laptops. When subjected to the Battery Eater testing tool, the ASUS ROG Strix Hero II took 3 hour and 41 minutes to dissipate its entire charge. This test is designed to burn the battery down as fast as possible and show off the minimum amount of battery life you can expect. As always, there’s still room for improvement. But, in context, this is probably one of the longest lasting gaming laptops we’ve encountered in 2018. Depending on how intensive the game you’re playing is, you can probably get a good couple of hours in before you’ll need to charge the Strix Hero II up again. 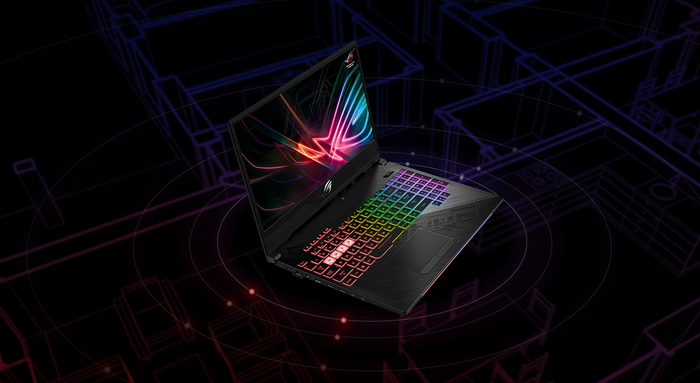 The ROG Strix Hero II isn’t the best gaming notebook that money can buy. However, there aren’t many that can outperform it on a strictly price-for-performance basis. This thing is a safe bet that offers solid performance at a competitive price. And if you happen to fall into the slice of the gaming audience that really does play one game and nothing else - then it's probably one of the safest bets out there.